My first swap was a success! If I do say so myself. I had a few "dead-beats", but I was bound & determined that nobody was going to get the shaft & I was able to fix their partners up with each other. One of my pet peeves is people who say they are going to do something, then don't. My partner, Janine at Pretty Personal Gifts was absolutely fabulous!!! I couldn't have picked anyone better! And now I have a new Blog Friend, which is the best part. How much do ya'll LOVE that pink & green monogrammed bucket!?! Is that not the cutest thing! I know some of my "pink & green" girlies are jealous, but don't you worry, you can find one for yourself on her website. She has some wonderful things & perfect gifts to give or keep for yourself! Janine got to know me so well. 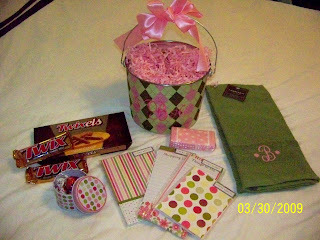 She got me that precious bucket, a pink & green monogrammed kitchen towel, pink polka-dotted pocket tissues (which are some of favorite things), some too cute Laura Ashley stationary & tin filled with Lindt chocolate truffles (my new faves), 2 Twix (which caused me to ship on my Lent sacrifice) & a box of Twixets (mini-Twix, I'd never seen them before, but I will be looking for some more!). I loved everything! So did my children. Baby Girl calls my bucket, my "Easta basset". But it is way too cute to just use for Easter! This is what I sent her. I hope she enjoys what I sent as much I'm enjoying what she sent me! Please check out her blog & her store. She is wonderful!!! I hope everybody enjoyed my Semi-Slacker's Spring Swap. Please let me know when you post about your goodies! I don't want to miss sharing in your excitement! Your swap was a smashing success! I posted about my swap goodies last night. Maggie and I were separated at birth, I think. I love everything you got and everything you gave. Thank you so much for organizing this and making sure it was fun for everyone. I love it all!!! Thanks for hosting; the swap was a blast! You are so lucky! I'm glad you had success with it. I totally got burned on my first and probably my last swap for Valentine's Day. You done good girl! 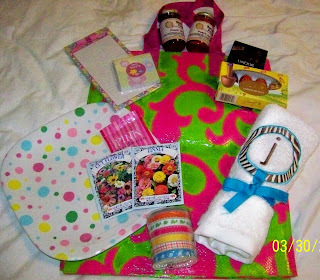 Thanks so much for putting this together:) Your goodies are too cute! You are da bomb! And you know why, too! Loved all the goodies! I did a post on her today cause she donated a darling happy for the P&G Bridal Shower!! Oh how fun, loved your stuff. I had so much fun doing this swap. It was my first and I absolutely loved it! Best of all I feel like I made a new friend. Thank you Tracy. You are wonderful. By the way your jam is to die for. I've hidden it from the riff raff around here. Keeping that for myself! I loved all the gifts. PERFECT. Thank you Tracy! I never heard of this swap? Sounds fun! By the way - how are my grands? I love your swap presents ;-) especially that Easta basset. I do hope to see pics of BG collecting her colored eggs in that bucket!!! I love all of the goodies you received and sent out. 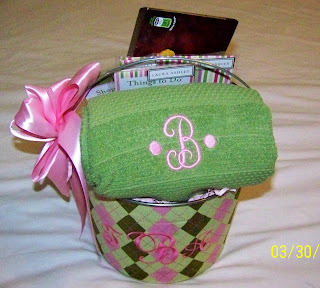 The preppy monogrammed bucket is so cute! Those look awesome. such fun. You did great!!! I would have loved to have participated in your swap, but this was just not a good time for me right now. It has been a bit crazy! You got some amazing items! It looks like the swap was a huge success. Don't you just love getting special surprises in the mail? It is so fun! Enjoy your goodies!! Love & blessings from NC! Sounds great! Let me know next round! I'd love to participate! I am finally able to sit a breathe for a moment. I did not realize that the week before the swap ended I would be taking my master's exit exam and the week after, the Army would be moving us, but I was able to send my package out in time and recieved a lovely one in return. I am off to post the pictures now! Thanks for letting me participate!